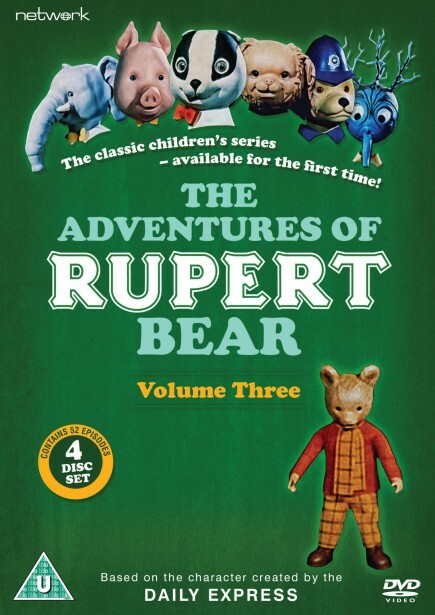 A formative part of many childhoods and the definitive television adaptation of the Daily Express's much-loved cartoon strip, The Adventures of Rupert Bear was a massively successful puppet series by Mary Turner and John Read. Featuring the most singable theme tune in television history, the series captivated a generation of younger viewers and cemented Rupert's popularity forever. Each episode saw the colourfully attired little bear enjoying a host of fantastic adventures with his friends, including Bill Badger, Edward Trunk, Podgy Pig, Algy Pug and ill-tempered twig-creature Raggety – with his flying go-kart often taking him to strange, faraway lands before whisking him back to his mother and father's house in Nutwood just in time for tea! 156 episodes were made over four series – with more than half previously believed to be either lost or held on an inferior format. Thankfully, the original film materials have now been unearthed and new transfers made for this release. This volume contains the 52 episodes from series four.